Nielsen has altered the preview of its Total Content Ratings system. Instead of allowing its media clients to analyze TCR data online as of January 1, it will provide off-line reports. Nielsen will look to have online TCR data available later this month. The request for the delay came from the TV networks, says Nielsen. TCR looks to consolidate all traditional, digital, and other TV/video viewing under one measurement system. 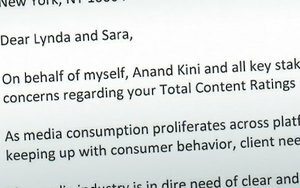 In December, Linda Yaccarino, chairman of advertising sales and client partnerships of NBCUniversal, sent a blistering letter to Nielsen concerning many issues of TCR [Total Content Ratings], including lack of participation from the industry, as well as VOD and OTT measurement issues. Industry sources says Nielsen met with Yaccarino soon after and went through the complaints point by point. A key concern among industry executives arises from TV networks that are not readying themselves through installing necessar y software, called SDKs -- Software Development Kits -- on their digital platforms. Nielsen has been hoping to have TCR system ready for use for TV network buyers and sellers for the upfront advertising market which takes place in summer June-August time period. TCR is part of Nielsen’s Total Audience Measurement framework, which includes Digital Content Ratings, Total Ad Ratings, Out of Home, C35 data and OTT data. 3 comments about "Nielsen Modifies Preview Of Total Content Ratings". dorothy higgins from Mediabrands WW, January 6, 2017 at 11:36 a.m. This reads as if the networks have been dilatory in providing the digital read software necessary to TCR. Is this a correct read? Ed Papazian from Media Dynamics Inc, January 6, 2017 at 12:03 p.m. It does read that way, Dorothy, and if that is the case, I'm not really surprised as the networks are probably very concerned about how each of them will look, relative to competition based on the new data.So they may be hedging their bets by cooperating selectively---platform by platform---to evaluate the results. Or it might just be tardiness on their part. By the way, Wayne, Nielsen is not measuring "viewing" in all venues, only device usage. The only medium where a panel member actually claims to be watching program----not commercial---content is in-home "linear TV". John Grono from GAP Research, January 6, 2017 at 9:26 p.m. The process of 'tagging up' the video player using the SDK, while better than some years ago, can still be a very time-consuming process. While some clients may already be seeing 'full data' to compare to internal records and to familiarise themselves with the data, others may just be embarking on the process. If I was tagged-up there would be no way I'd want my untagged fellow broadcasters seeing my data! Basically everyone has to play, and everyone has to play fairly. Release will be constrained by the slowest player in the industry. And yes, we face the same issue here in Australia (and not just for video).